At the tender age of 14, Alexandra Millet resolved to find a career where she could help people with disabilities. While volunteering for Shake-A-Leg Miami, she met a 5-year-old boy who couldn’t walk. Millet helped the boy use a kayak that day. She found her calling. 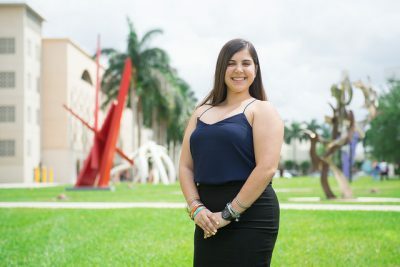 In the years that followed, Millet researched her career options and decided to pursue a recreational therapy degree at FIU so she could better help people with disabilities. She would also become close friends with Raquel Cruz. They bonded over baseball. Millet’s brother played high school ball and so did Cruz’s son. As the season progressed so did their friendship. Millet eventually came to learn Cruz was a Gulf War veteran who has post-traumatic stress disorder. Millet said Cruz was helped greatly by her service dog, Blue, an American bulldog. 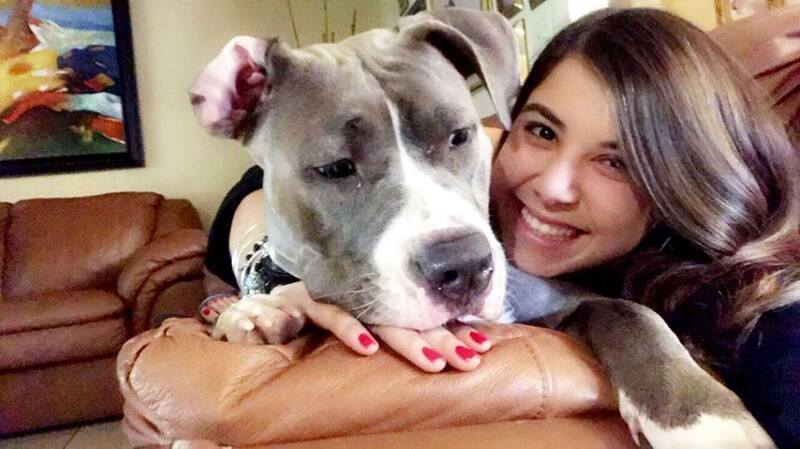 Blue was killed by car in the summer of 2016. “The only thing keeping her steady was the service dog,” Millet said. Then Cruz learned that Blue had sired eight puppies with a friend’s dog she was fostering. Millet and Cruz hatched a plan to start a non-profit that would provide service dogs to help veterans like Cruz cope with battlefield injuries. In three short months, they founded Blues for Vets. Blue’s puppies are being trained as service dogs to one day provide support for veterans. With commencement just days away, Millet is also interning at Miami’s Veterans Affairs Hospital. In the fall, she will begin working toward a master’s degree in occupational therapy. She’ll also continue serving as vice president of Blues for Vets. I am very proud of my niece Alexandra M. Millet. I am very proud of all your accomplishments. My you continue to grow and blessings to you always. Thank you for helping me when I was need of your guidance and support in December 2014. Your aunt love always and admiration and respect for all your accomplishment made everyone very proud.